We have been getting ourselves prepared for yet another move. 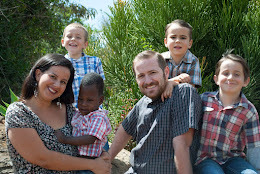 We thank God that He has allowed us to live in a few different places since moving to Kenya. This will be the fourth house our family has been in in just two years. We have been painting our new house. This house has some sentimental value to it as we are moving into the old Gorden household. We are so excited and blessed that we can stay out here in Rongai because we will still be looking out into the game park and the kids will have lots of room to play. Our landlords will be the German Family we have been housesitting for and they are a wonderful family in the Lord. We have been trying to settle into a routine here, trying to balance taking care of someone else's home, their pets and getting our new home clean and prepared for us to move in. One of our exciting projects is our gardening endeavors. Jonathan has started a garden for the German family for when they get home. We have harvested so much from the garden already! Every time we pull lettuce from the garden our heart swells with pride because we've NEVER done anything like this before! Praise God! Recently we were eating dinner when we spotted some giraffe outside our home and we ran outside to watch. Here's a picture we snapped. Notice the kids still have their bibs on! We though you'd get a kick out of seeing this awesome photo. We have received our approval for our visas and we take our passports in next week to get them stamped! Thank you Lord! We are also getting excited to visit friends and family as we prepare to come back to the states Nov. 10th. We are looking forward to seeing as many of you as possible! Please pray for all the details surrounding our flights and our time in the states. We thank God for your continual prayers for our family out here. Earlier in the month Jonathan got an amoeba and was very ill but we praise God that he has fully recovered and God was so faithful to our family for carrying us through that rough period.